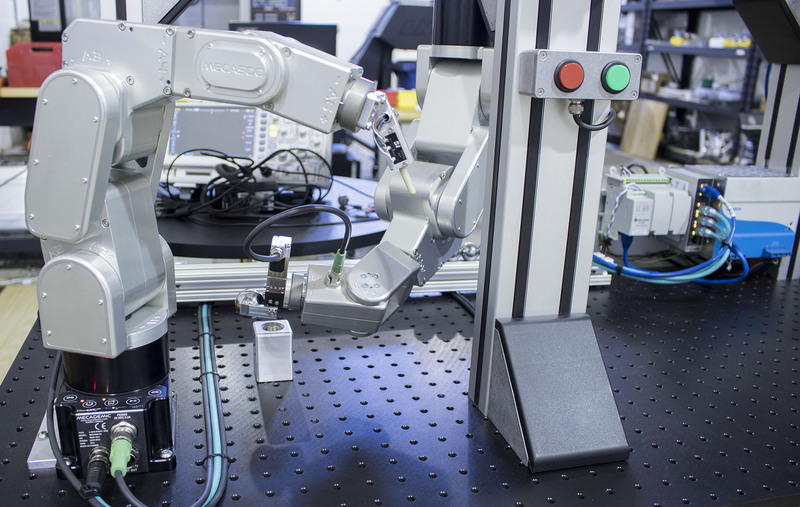 The smallest industrial 6-axis robot with a unique repeatability of ± 0,005 mm and an integrated controller in the robot base. When fully extended, the length of the Meca500 robot arm is about 332 mm. The Meca500 weighs 4,5 kg and has a payload of 0,5 kg. Meca500’s controller is embedded in its palm-sized base. There is no bulky controller cabinet, no teach pendant, no messy cables. With its tiny footprint, the Meca500 is the perfect choice for small, confined spaces. 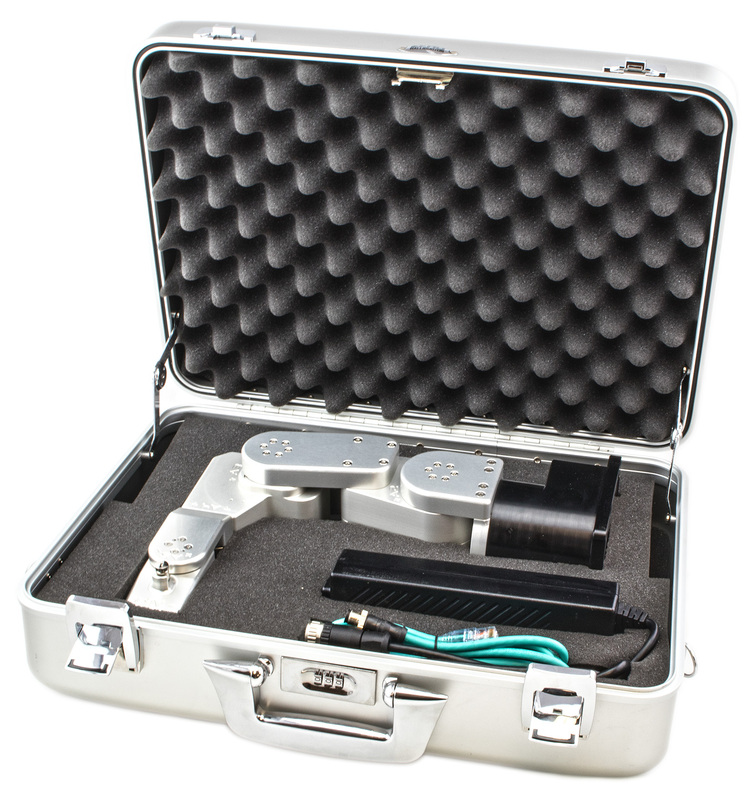 Equipped with the best available zero-backlash speed reducers and with high-resolution encoders, and having a body made entirely of aluminum, the Meca500 has a repeatability of 0,005 mm. 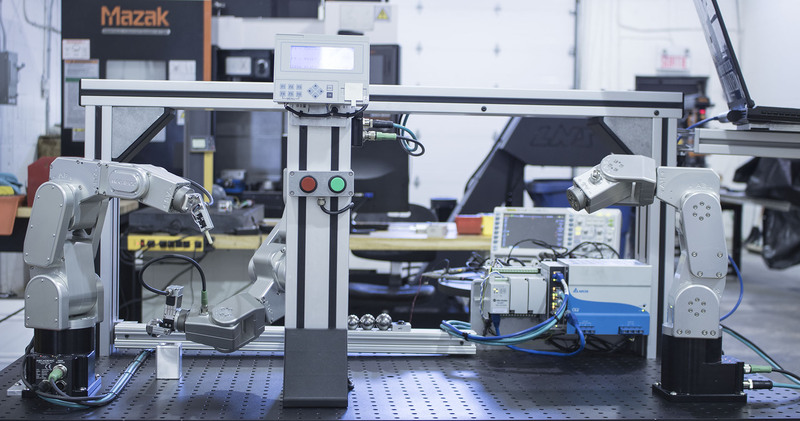 Moreover, because all of its structural components are precision machined, precision assembled and inspected at Mecademic, the Meca500 boasts unmatched position and path accuracy too. Its path accuracy is better than 0,1 mm. 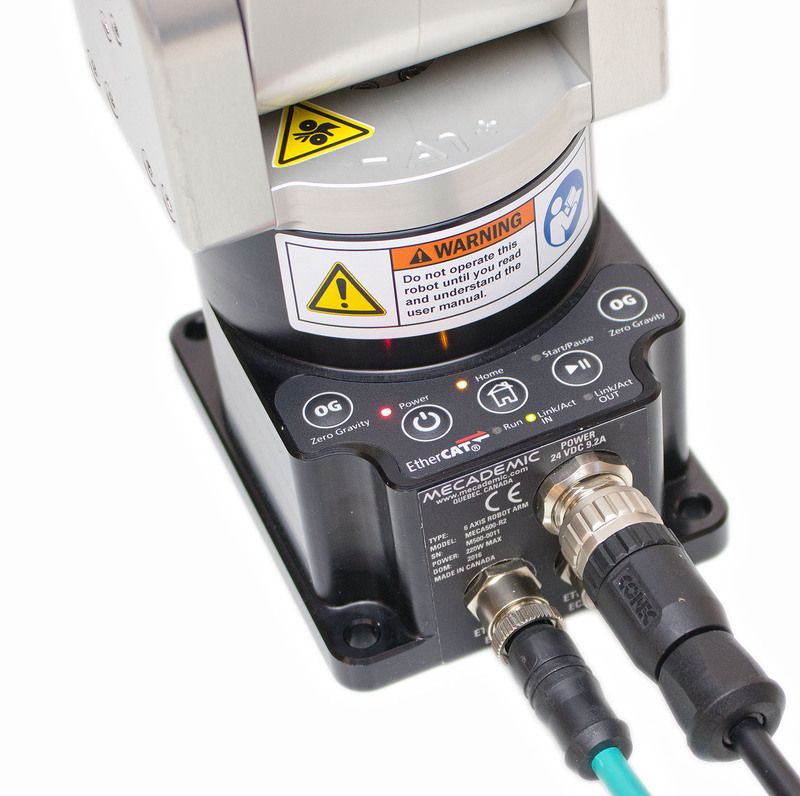 The Meca500 is a plug-and-work automation component, offering great flexibility and simplicity. There are no training courses to take, no software to install, no options to purchase. Simply permanently connect the robot to a computer or a PLC via the Ethernet cable provided and use the programming language of your choice (Java, C#, Python, etc.). In your program, send Mecademic's proprietary commands to the robot arm (as parsed strings) over TCP/IP. The commands are typical robot instructions such as MoveLin(x,y,z,w,p,r). Similarly, the robot's controller sends back strings with various types of feedback. In addition, an intuitive web interface for operating the robot resides in the robot's controller and can be accessed via a web browser.